A staple of the holiday season is an inviting pine wreath on your front door. 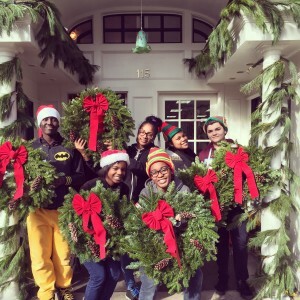 For the third year in a row, Lifting Up Camden’s Youth Outreach has been hard at work creating wreaths just in time for the holidays, all to benefit the organization. LUCY is holding its 3rd Annual Holiday Wreath Sale at 117 Kings Highway in Haddonfield once again this holiday season. Each Friday from 4 p.m. to 9 p.m., Saturday from 10 a.m. to 9 p.m. and Sunday 10 a.m. to 6 p.m. through Dec. 20, LUCY program participants, staff and volunteers will sell holiday wreaths and poinsettias to raise money for the program. LUCY — one of six ministries of St. Joseph’s Pro-Cathedral supported by The Joseph Fund — provides a safe place for Camden’s youth to gain valuable life skills, increase confidence and receive academic instruction and spiritual and social support. Participants learn the importance of service and giving back to the community and enact that learning through various community service activities. The creating of wreaths by youth participants has been an activity with LUCY for about 20 years. The wreaths were sold by volunteers out of cars, at churches and in neighborhoods to benefit the organization. The program kept getting bigger when Angelo Alberto, principal Joseph Fund board liaison, suggested getting a storefront in Haddonfield to help accommodate the need. Since then, LUCY has been having the wreath sale in Haddonfield to raise money at a more convenient and central location, and to help serve as a teaching model for youth on how to manage a business. “The youth are taking accountability in this. Since taking over the program, our setup has been having the kids be involved and hands-on in the process. We wanted the kids to learn how to run a small business. They earn customer service skills and see how to design, make and sell a product. “It’s important to become more business savvy at a young age. This is experience they can put on their resume and college application,” Prinn said. Gerald Lavin of Zues Development donated the storefront this year, at 117 Kings Highway. In preparation for the sale, LUCY youth made their own decorations and outfitted the storefront with colorful holiday décor. “The kids love it. We all just have fun with it. They put on Christmas music, bundle up in hats and coats around the space heater and have fun bonding and working hard together, knowing the proceeds will benefit them and the program,” Prinn said. Pine wreaths can be purchased in two sizes, 12 inches for $25 or 36 inches for $40, and each comes with pinecones, berries and a decorative six-inch bow. Poinsettias are also available for purchase in two sizes, six inches for $10 or eight inches for $15. “The quality, from what we have heard (from customers), is better than anyone has ever seen. Knowing that the youth put each wreath together, decorating it and making it look beautiful, makes it more personalized and special,” Prinn said. This year, to help accommodate the high volume of wreath orders, LUCY has made it possible for individuals to pre-order online. The online ordering allows the volunteers to keep organized as well as to make it more accessible and convenient for customers. 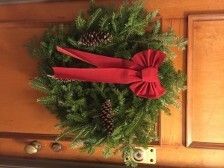 To purchase or pre-order your wreaths or poinsettias, visit www.lucyoutreach.org/wreaths. “Adding the online option has increased our sales in the first few weeks,” Prinn said. The fundraising goal for this year is $20,000. Last year, LUCY made $15,000. All of the money will go toward LUCY for programs, educational trips, college support and assistance, and general operating costs, just to name a few. “Twenty thousand dollars might be too high of a goal, but $20,000 would be awesome to achieve,” Prinn said. For more information on LUCY Outreach or to donate toward the program, visit lucyoutreach.org.